Extended Validation SSL Certificate-WoSign SSL Certificates! EV SSL is a Extended Validation SSL certificate issued by WoSign, when the browser visit a EV SSL secured website, the address bar turns green to tell customer this is a trustworthy website. Same green bar, but cost less! Green means "Trust"
EV SSL is the best SSL certificate option for organizations that deal with sensitive personal and financial information, credit card details, or login credentials. When visitors login your website, enabled by an EV SSL Pro, the address bar will turn green, showing that your website has been verified as authentic and it is not a scam or phishing site. This will secure your business data, and set your customers at ease when they are going to submit private information on the site. Extended Validation triggers the green address bar in high security browsers. Up to 256-bit encryption secures online transactions. WWW-Free of Charge——When you are applying for a non-www version domain, the www version will send together to you freely. Free 24/7 support, express renewal, and a 30-day money back guarantee. Reissue Warranty——In the whole valid period of the certificate, we offer free reissuing service. Support SANs ,Subject alternative names (SANs) allow a single server to host multiple domains. Standard SSL certificates enable a minimum of 40-bit and up to 256-bit SSL encryption. Plus: SSL Installation Checker, free revoke and replace, and a 500000 RMB warranty. The WoSign Site Seal provides consumers and businesses with the assurance that the website is highly-trusted and secure. 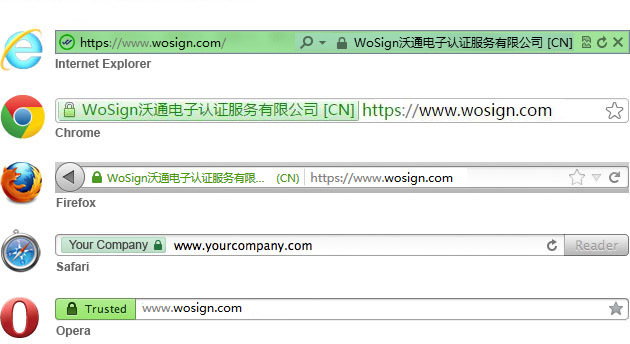 Buy a WoSign EV Pro SSL Certificate, More value, no additional cost. What does EV look like in Internet Explorer, Firefox,, Safari, Opera, and Chrome?